I arrived in Paris yesterday, and since then have had a day and a half of interesting meetings and conversations already. I got here in time Sunday to take in the second half of the Forum of ICH Researchers meeting at la Maison des Cultures du Monde. The first panel session was on community participation in the safeguarding of ICH under the Convention, chaired by Toshiyuki Kono. There were several different papers presented, but the two that interested me particularly were the papers given by Win van Zanten, an ethnomusicologist from the University of Leiden, and Marc Jacobs, the director of the Flemish Interface Centre for Cultural Heritage. Van Zanten looked at some of the short films on the UNESCO website for Intangible Cultural Heritage (see some of them here). He argued that they were important because they increase the visibility of ICH, but thought that they could do more to document the tradition in relation to community, and that the larger social context could be better documented. He also raised the idea of showing the film back to community, filming their reaction, and include their comments. Jacobs presented on heritage communities and safeguarding programs, and argued that the critical success factor to safeguarding programs is the presence of a cultural broker, someone who can walk the community through the processes involved in an ICH project. He argued that these mediators are crucial for building bridges, and providing followup that goes beyond pure documentation. It was music to my ears, and a validation of the work we are undertaking with the Heritage Foundation of Newfoundland and Labrador, particularly the project-based training model we are working on, and which we will hopefully be doing more with later this year. The second panel session was on identifying priority areas for research, facilitated by Harriet Deacon, Hon. Research Fellow at the University of Capetown. I've followed her excellent posts on Twitter @the_archive for a while now, so it was nice to meet her in person. Misako Ohnuki, Deputy Director of the International Research Centre for ICH in Asia and the Pacific Region, who I'd also only ever met online, was first up, talking about documentation as a tool for safeguarding the ICH of communities. Then Deacon and Chiaro Bortolotto talked about their impressive project to document and track current published research on ICH. It was noted that there are gaps in the research, with a large amount of grey literature that has not been documented, and a growing body of practical handbooks, guides and suchlike documents being produced by NGOs which are not part of the academic literature. The meeting ended with a decision that the Forum should meet again, annually if possible. I'll keep you posted on developments. This morning was the start of the fourth session of the General Assembly of the States Parties to the Convention for the Safeguarding of the Intangible Cultural Heritage at UNESCO Headquarters. It was a fascinating day, with some very interesting comments made by a variety of state party representatives. One of the topics up for debate was whether there should be a ceiling placed on the number of nominations the secretariat can examine each year for the Convention's Lists, which include the List of Intangible Cultural Heritage in Need of Urgent Safeguarding, and the Representative List of the Intangible Cultural Heritage of Humanity. The presentations were insightful and at times passionate. The general consensus was that a ceiling on the number of nominations is necessary because of the time and resources required to properly assess each nomination. But there was also a general sense that the List of Intangible Cultural Heritage in Need of Urgent Safeguarding not be limited, as it represents traditions under particular threat. 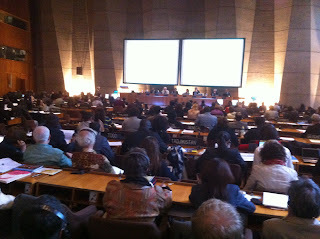 There is also a listing of programmes, projects and activities for the safeguarding of intangible cultural heritage considered to best reflect the principles and objectives of the Convention, a list which seems to be somewhat undersubscribed, and it was suggested that due to the small number of listings, a cap not be placed on that list either. A need for best practices led to many state party representatives talking about the importance of safeguarding ICH, stating that the listing of traditions is less important within their jurisdictions than the active safeguarding of those traditions to ensure they continue at the community level. 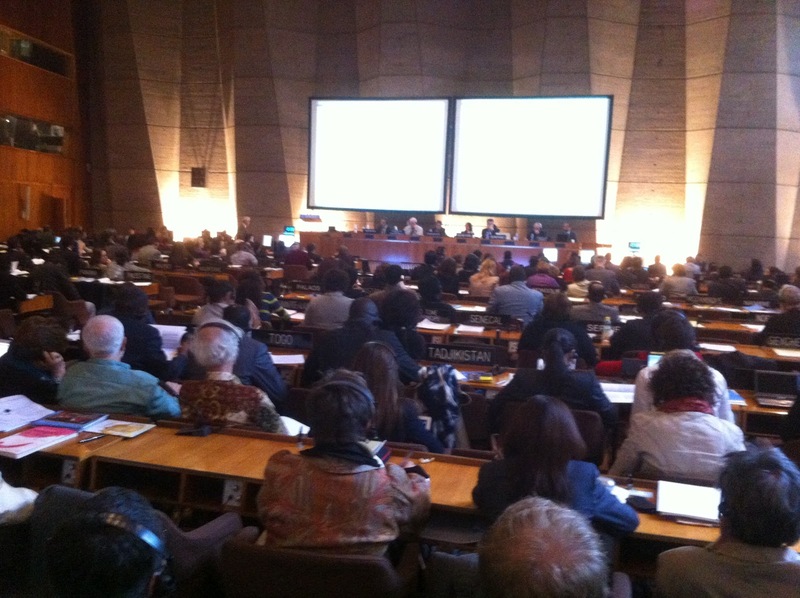 Many state parties returned to this theme over the course of the day: Austria noted the importance of UNESCO capacity-building initiatives in safeguarding ICH, Cuba talked about the need for ICH training at regional level; Jordan expressed the importance of community-level work in safeguarding ICH; and St Lucia stressed that listing is less important to some regions than the work inventorying and safeguarding. All in all, a fascinating day, and a remarkable first look, for me, at how the ICH General Assembly works. 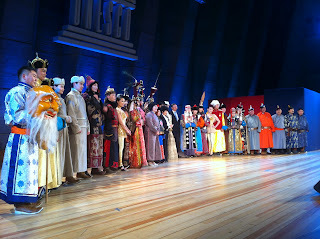 The day ended with a rather remarkable presentation from Mongolia, mixing traditional ethnic costume, high fashion, traditional (and very modern) music, dance, throat singing, gymnastics, contortionism, and hand-balancing. All in a day's work, really. Sleep, soon, perhaps, with another three days yet to come, and the ICH non-governmental organizations' meeting first thing tomorrow morning!